How is the staging determined for Hodgkin's lymphoma? What is the treatment for Hodgkin's lymphoma? Who are the doctor's who treat Hodgkin's lymphoma? How do people get a second opinion for Hodgkin's lymphoma? What is the follow-up care after treatment for Hodgkin's lymphoma? What other support is available for cancer patients? Hodgkin's lymphoma is a type of lymphoma (cancer of the lymphatic system). The most common symptom of Hodgkin's lymphoma is a painless swelling in the lymph nodes in the neck, underarm, or groin. Some of those affected have other symptoms like fever, night sweats, fatigue, itching, or weakness. Hodgkin's lymphoma is most common among teens and adults aged 15 to 35 years and adults aged 55 years and older. Risk factors may include a weakened immune system, HIV or EBV infection, and a family history of the disease. Hodgkin's lymphoma is diagnosed when abnormal tissue is detected by a pathologist after a biopsy of an enlarged lymph node. The abnormal cells in Hodgkin's lymphoma are called Reed-Sternberg cells. Staging of Hodgkin's lymphoma refers to the extent of spread of the abnormal cells within the body. Imaging studies such as CT scanning, MRI, or PET scanning may be done to determine the stage of Hodgkin's lymphoma. Treatment of Hodgkin's lymphoma depends on the symptoms, stage and location of disease, as well as the age and health of the patient. Treatment of Hodgkin's lymphoma usually includes radiation therapy or chemotherapy. Regular follow-up examinations are important after treatment for Hodgkin's lymphoma. Patients treated for Hodgkin's lymphoma have an increased risk of developing other types of cancer later in life, especially leukemia. Peripheral blood stem cell transplantation is a new technique in which stem cells are obtained from a patient's blood and used in bone marrow transplantation. Lymph vessels: The lymph system has a network of lymph vessels. Lymph vessels branch into all the tissues of the body. Lymph: Lymph vessels carry clear fluid (lymph). Lymph contains white blood cells, especially lymphocytes such as B cells and T cells. 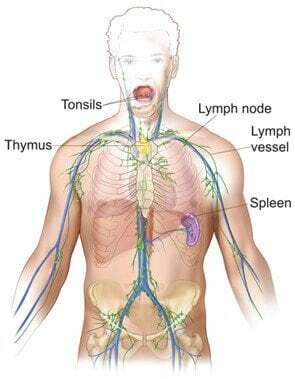 Lymph nodes: Lymph vessels are connected to small, round organs called lymph nodes. Groups of lymph nodes are found in the neck, armpits, chest, abdomen, and groin. Lymph nodes store white blood cells. They trap and remove harmful substances that may be in lymph. Other parts of the lymph system: Other parts of the lymph system include the tonsils, thymus, and spleen. Lymph tissue is also found in other parts of the body including the stomach, skin, and small intestine. This picture shows the lymph system -- tonsils, thymus, lymph vessels, lymph nodes, and spleen. Hodgkin lymphoma starts in the lymph system, usually in a lymph node. The disease may be found because of a swollen lymph node in the neck, chest, or other areas. The disease begins when a lymphocyte (almost always a B cell) becomes abnormal. The abnormal cell divides to make copies of itself. The copies keep dividing, making more abnormal cells that build up. When white blood cells collect around the abnormal cells, the lymph node that contains abnormal cells becomes swollen. Abnormal cells may spread through the lymph vessels or blood vessels to other parts of the body. Although normal cells die when they get old or damaged, abnormal cells don't die. Also unlike normal cells, abnormal cells can't help the body fight infections. In 2013, more than 9,000 Americans will be diagnosed with Hodgkin lymphoma. About 4,000 of these people will be children, teens, and adults younger than 35 years old. Most people diagnosed with Hodgkin lymphoma have the classical type. In 2013, about 8,550 Americans will be diagnosed with this type. In classical Hodgkin lymphoma, the abnormal cell is called a Reed-Sternberg cell. See photo of the large cell below. Other abnormal cells may also be found in people with classical Hodgkin lymphoma. These cells are called Hodgkin cells. They are larger than normal lymphocytes but smaller than Reed-Sternberg cells. 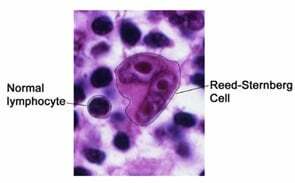 Picture of normal lymphocyte and Reed-Sternberg lymphocyte. In 2013, about 450 Americans will be diagnosed with lymphocyte-predominant Hodgkin lymphoma. In this rare type of Hodgkin lymphoma, the abnormal cell is called a lymphocyte-predominant cell, and the treatment options are different. After you learn that you have Hodgkin lymphoma, you may need other tests to help with making decisions about treatment. Staging tests can show the stage (extent) of disease, such as whether lymphoma cells are found in more than one group of lymph nodes. Lymphoma cells usually spread from one group of lymph nodes to the next. For example, Hodgkin lymphoma that starts in lymph nodes in the neck may spread first to lymph nodes above the collarbones, and then to lymph nodes under the arms and within the chest. In time, lymphoma cells can invade blood vessels and spread to almost any other part of the body. For example, they can spread to the liver, lungs, bone, and bone marrow. CT scan: Your doctor may order a CT scan of your neck, chest, abdomen, and pelvis. An x-ray machine linked to a computer will take a series of detailed pictures of these areas. You'll receive contrast material by mouth and by injection into a blood vessel in your arm or hand. The contrast material makes swollen lymph nodes and other abnormal areas easier to see. The pictures can show whether Hodgkin lymphoma has spread. PET scan: Your doctor may use a PET scan to find Hodgkin lymphoma that has spread. You'll receive an injection of a small amount of radioactive sugar. A machine makes computerized pictures of cells in your body that have taken up the radioactive sugar. Because lymphoma cells take up sugar faster than do normal cells, areas with lymphoma cells look brighter on the pictures. Bone marrow biopsy: To check for lymphoma cells in the bone marrow, your doctor will use a thick needle to remove a small sample of bone and bone marrow from your hipbone or another large bone. Local anesthesia can help control pain. Other staging tests may include biopsies of lymph nodes or other tissue. What type of Hodgkin lymphoma do I have? Has the lymphoma spread? Was it found on both sides of the diaphragm? Doctors describe the stages of Hodgkin lymphoma using the Roman numerals I, II, III, and IV. Stage I is early-stage cancer, and Stage IV is advanced cancer, such as Hodgkin lymphoma that has spread to the liver. Lymphoma cells are in one lymph node group (such as the lymph nodes in the neck or armpit). Very rarely, Hodgkin lymphoma may start somewhere in the body other than a lymph node and lymphoma cells are found in only that one part. Lymphoma cells are in at least two lymph node groups, but both groups are on the same side of the diaphragm. Or, lymphoma cells are in one part of a tissue or an organ and the lymph nodes near that organ on the same side of the diaphragm. Lymphoma cells may be in other lymph node groups on the same side of the diaphragm. Lymphoma cells are in lymph nodes on both sides of the diaphragm. Lymphoma cells may also be found in one part of a tissue or an organ near these lymph node groups or in the spleen. Lymphoma cells are found in several parts of at least one organ or tissue. Or, lymphoma cells are in an organ (such as the liver, lung, or bone) and in lymph nodes on the other side of the diaphragm. In addition to using the Roman numerals I, II, III, and IV, doctors describe the stages of Hodgkin lymphoma with the letters A, B, E, and S.
A (without symptoms): You have not had symptoms, such as weight loss, drenching night sweats, or fevers. B (with symptoms): You have had symptoms, such as weight loss, drenching night sweats, or fevers. E (outside the lymph system): Lymphoma is found in tissues outside the lymph system, such as in liver or lung tissue. Other less common places to find lymphoma include the bone, bone marrow, skin, digestive tract, kidneys, ovaries, or testicles. For example, the stage may be IIE. S (in the spleen): Lymphoma is found in the spleen. For example, the stage may be IIIS. The treatment that's right for you depends mainly on the type of Hodgkin lymphoma (most people have classical Hodgkin lymphoma), where the lymphoma was found in your body (its stage), and whether you've had weight loss, drenching night sweats, or fevers. It also may depend on whether you have a tumor that is bigger than 10 centimeters (4 inches). You may receive more than one type of treatment, such as chemotherapy and radiation therapy. At any time, care is available to prevent infections, control pain, relieve the side effects of treatment, and ease emotional concerns. You can get information about coping on NCI's website at http://www.cancer.gov/cancertopics/coping. Also, you can get information about coping from NCI's Cancer Information Service at 1-800-4-CANCER (1-800-422-6237). Or, chat using NCI's instant messaging service, LiveHelp (https://livehelp.cancer.gov). Whenever possible, people should be treated at a medical center that has doctors experienced in treating Hodgkin lymphoma. If this isn't possible, your doctor may discuss the treatment plan with a specialist at such a center. Your doctor may be able to refer you to specialists. You can ask a hospital, medical school, or medical society for names of specialists near you. NCI's Cancer Information Service can give you information about treatment centers near you. Call 1-800-4-CANCER (1-800-422-6237). Or, chat using LiveHelp (https://livehelp.cancer.gov), NCI's instant messaging service. Other sources can be found in the NCI fact sheet How To Find a Doctor or Treatment Facility If You Have Cancer. Medical oncologist: A medical oncologist is a doctor who specializes in treating Hodgkin lymphoma and other cancers with chemotherapy, targeted therapy, and stem cell transplants. Radiation oncologist: A radiation oncologist is a doctor who specializes in treating Hodgkin lymphoma and other cancers with radiation therapy. Your health care team may also include an oncology nurse, a social worker, and a registered dietitian. Ask your health care team about your treatment options, the expected results of each option, and possible side effects. Because cancer treatments often damage healthy cells and tissues, side effects are common. These side effects depend on many factors, including the type of treatment. The specific side effects may not be the same for everyone, and they may even change from one treatment session to the next. You may want to talk with your doctor about taking part in a research study (clinical trial) of new treatment methods. Research studies are an important option for people with Hodgkin lymphoma. See the Treatment Clinical Trials section. Would a treatment research study be right for me? Before starting treatment, you might want a second opinion about your diagnosis and treatment options. Some people worry that the doctor will be offended if they ask for a second opinion. Usually the opposite is true. Most doctors welcome a second opinion. And many health insurance companies will pay for a second opinion if you or your doctor requests it. Some insurance companies actually require a second opinion. If you get a second opinion, the second doctor may agree with your first doctor's diagnosis and treatment recommendation. Or, the second doctor may suggest another approach. Either way, you have more information and perhaps a greater sense of control. You can feel more confident about the decisions you make, knowing that you've looked at all of your options. It may take some time and effort to gather your medical records and see another doctor. In most cases, it's not a problem to take several weeks to get a second opinion. The delay in starting treatment usually will not make treatment less effective. To make sure, you should discuss this delay with your doctor. Some people with Hodgkin lymphoma need treatment right away. For anyone thinking about cancer treatment, clinical trials are an option. Clinical trials are research studies that involve people. They are an option for all stages of cancer. Cancer research has led to real progress in the treatment of Hodgkin lymphoma. Because of research, most people diagnosed with Hodgkin lymphoma can now be cured, or their disease can be controlled for many years. Doctors continue to search for new and better ways to treat Hodgkin lymphoma. Like all other treatment options, clinical trials have possible benefits and risks. But, by looking closely at all options, including clinical trials, you are taking an active role in a decision that affects your life. Even if you don't benefit directly from the treatment under study, you may still make an important contribution by helping doctors learn more about Hodgkin lymphoma and how to control it. If you're interested in being part of a clinical trial, talk with your doctor. In addition, NCI's Cancer Information Service can answer your questions and provide information about clinical trials. Contact CIS at 1-800-4-CANCER (1-800-422-6237) or at LiveHelp (https://livehelp.cancer.gov). You can search for clinical trials of Hodgkin lymphoma at http://www.cancer.gov/clinicaltrials/search on NCI's website. Most people with Hodgkin lymphoma are treated with chemotherapy. 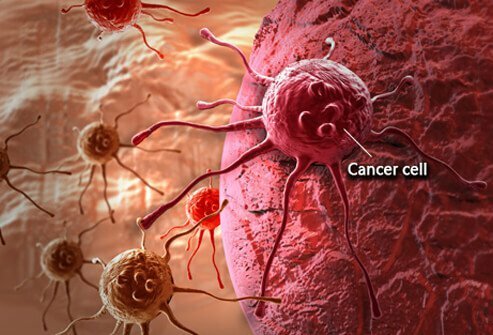 Chemotherapy uses drugs to kill lymphoma cells. Many drugs are used for Hodgkin lymphoma. Usually, the drugs are given through a thin needle directly into a vein (intravenously). Some are given by mouth. You'll probably receive a combination of drugs in a clinic, at the doctor's office, or at home. Some people need to stay in the hospital during treatment. Blood cells: When drugs lower the levels of healthy blood cells, you're more likely to get infections, bruise or bleed easily, and feel very weak and tired. Your health care team will check for low levels of blood cells. If your levels are low, your health care team may stop the chemotherapy for a while or reduce the dose of the drug. Cells that line the digestive tract: Chemotherapy can cause a poor appetite, nausea and vomiting, diarrhea, or mouth blisters. Your health care team can give you medicines and suggest other ways to help with these problems. Ask your health care team whether the chemotherapy used for Hodgkin lymphoma could make you unable to have children. The fertility of adults may be harmed by the drugs, but most children treated for Hodgkin lymphoma seem to have normal fertility when they grow up. If you want to have a child someday after treatment, you may choose to store sperm or eggs before treatment starts. Some of the drugs used for Hodgkin lymphoma can cause heart disease or cancer later on. See the Follow-up Care section for information about checkups after treatment. The NCI booklet Chemotherapy and You has helpful ideas for coping with chemotherapy side effects. People with lymphocyte-predominant Hodgkin lymphoma may be treated with a targeted therapy. The drug binds to lymphoma cells, and the body destroys them. People receive targeted therapy directly into a vein through a thin needle. The drug may cause nausea, vomiting, diarrhea, night sweats, or tingling hands or feet. Side effects usually go away after treatment ends. You may want to read the NCI fact sheet Targeted Cancer Therapies to learn more about this type of treatment. Many people with classical or lymphocyte-predominant Hodgkin lymphoma receive radiation therapy after chemotherapy. Some people with lymphocyte-predominant Hodgkin lymphoma receive radiation therapy without chemotherapy. Radiation therapy can destroy lymphoma cells, shrink tumors, and help control pain. Radiation therapy for Hodgkin lymphoma is usually given by a large machine outside the body. This kind of radiation therapy won't make you radioactive. While you're lying on a treatment table, the machine will aim high-energy rays that you can't see or feel at the areas affected by the Hodgkin lymphoma. Each treatment session usually lasts less than 30 minutes. You'll probably go to a hospital or clinic for radiation therapy 5 days a week for several weeks. Side effects may develop during radiation therapy or years later. Side effects depend mainly on how much radiation is given and on what part of your body receives treatment. For example, radiation to your chest and neck may cause a cough or shortness of breath. It's common for skin in the treated area to become red, dry, and itchy. Check with your doctor before using lotion or cream in that area. After treatment is over, your skin will slowly return to normal. You're likely to become tired during radiation therapy, especially in the later weeks of treatment. Although getting enough rest is important, most people say they feel better when they exercise every day. Try to go for a short walk, do gentle stretching exercises, or do yoga. It may help to know that, in most cases, the side effects of radiation therapy are not permanent. However, you may want to ask your doctor about the chance of possible long-term effects. After treatment is over, some people have an increased chance of developing a second cancer, such as breast or lung cancer. Also, radiation therapy aimed at the chest may cause heart or thyroid disease. Women who have radiation therapy aimed at the pelvis may have hot flashes and vaginal dryness, and their menstrual periods may stop. Menstrual periods are more likely to return for younger women. Radiation therapy aimed at the pelvis can make both women and men unable to have children. This side effect may be temporary or permanent. People with Hodgkin lymphoma who may want to have a child after treatment should ask their health care team about ways to preserve their eggs or sperm before radiation therapy starts. The NCI booklet Radiation Therapy and You has helpful ideas for coping with radiation therapy side effects. Some people with Hodgkin lymphoma receive a stem cell transplant. A transplant of blood-forming stem cells allows you to be treated with high doses of chemotherapy. The high doses destroy both lymphoma cells and healthy blood cells in the bone marrow. Stem cell transplants take place in the hospital. You may need to stay in the hospital for several weeks. After you receive high-dose chemotherapy to kill lymphoma cells, you'll receive healthy stem cells through a flexible tube placed in a large vein in your neck or chest area. New, healthy blood cells will develop from the transplanted stem cells. The healthy blood cells will replace the abnormal ones that were destroyed by treatment. Healthy stem cells may come from you, or they may come from a family member or another donor. If the healthy stem cells will come from you, then stem cells will be removed from your body before you receive high-dose chemotherapy. The stem cells may be treated to kill any lymphoma cells that may be present, and the healthy stem cells are then frozen and stored until the stem cell transplant takes place. You may want to read the NCI fact sheet Bone Marrow Transplantation and Peripheral Blood Stem Cell Transplantation. It tells about the types of transplants and their side effects. How long will I be in the hospital? Will I need special care? How will I be protected from germs? What are the risks and side effects? What can we do about them? Eating well is important before, during, and after treatment for Hodgkin lymphoma. You need the right amount of calories to maintain a good weight. You also need enough protein to keep up your strength. Eating well may help you feel better and have more energy. Sometimes, especially during or soon after treatment, you may not feel like eating. You may be uncomfortable or tired. You may find that foods don't taste as good as they used to. In addition, poor appetite, nausea, vomiting, mouth blisters, and other side effects of treatment can make it hard for you to eat. Your doctor, a registered dietitian, or another health care provider can suggest ways to help you meet your nutrition needs. Also, the NCI booklet Eating Hints has many useful recipes and lists of foods that can help with side effects. After treatment for Hodgkin lymphoma, you'll need regular checkups, such as every 3 or 4 months for the first year and less often after that. Checkups help ensure that any changes in your health are noted and treated if needed. If you have any health problems between checkups, contact your doctor. Hodgkin lymphoma may come back after treatment.Your doctor will check for the return of lymphoma. Checkups also help detect health problems that can result from cancer treatment, such as heart disease, thyroid disease, or cancer. Checkups may include a physical exam, blood tests, chest x-rays, CT scans, or other tests. You may find it helpful to read the NCI booklet Facing Forward: Life After Cancer Treatment. You may also want to read the NCI fact sheet Follow-up Care After Cancer Treatment. Learning that you have Hodgkin lymphoma can change your life and the lives of those close to you. These changes can be hard to handle. It's normal for you, your family, and your friends to need help coping with the feelings that a diagnosis of cancer can bring. Concerns about treatments and managing side effects, hospital stays, and medical bills are common. You may also worry about caring for your family, keeping your job, or continuing your daily activities. Support groups can also help. In these groups, people with Hodgkin lymphoma or their family members meet with other patients or their families to share what they have learned about coping with the disease and the effects of treatment. Groups may offer support in person, over the telephone, or on the Internet. You may want to talk with a member of your health care team about finding a support group. NCI's Cancer Information Service can help you locate programs, services, and NCI publications. Call 1-800-4-CANCER (1-800-422-6237). Or, chat using LiveHelp (https://livehelp.cancer.gov), NCI's instant messaging service. "Hodgkin Lymphoma." National Cancer Institute. 13 July 2013. What were the early symptoms of your Hodgkin's disease? What types of tests and exams led to a diagnosis of Hodgkin's disease? Do you, a friend, or relative have Hodgkin's? Please share your experience. What types of treatment, including medication, have you received for Hodgkin's disease? What diet and/or exercise program do you follow to maintain your weight and good health? Regular checkups are vital in the treatment of Hodgkin's lymphoma. What kinds of follow-up care do you receive?